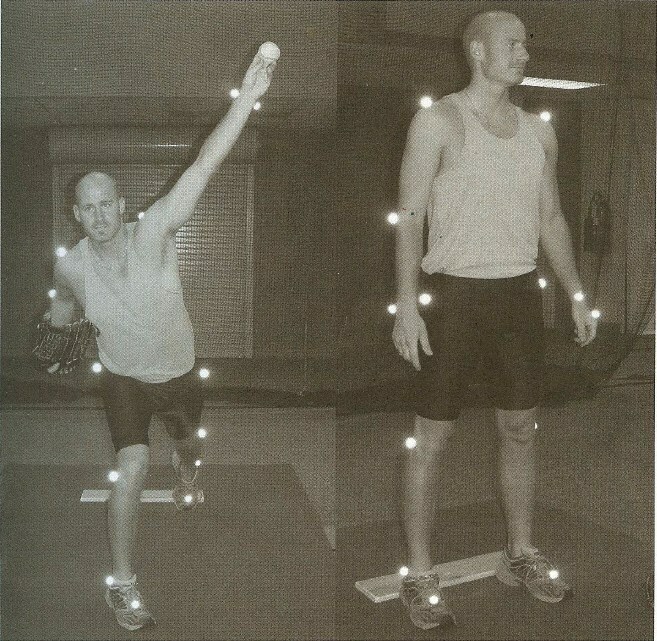 The American Sports Medicine Institute (ASMI) has been researching pitching biomechanics for over 25 years as highlighted in the ASMI research page. Their research programs have contributed significantly to the publicly available information regarding pitching biomechanics. However, I feel that the methodologies they employ for measurement of pitching arm side (PAS) kinematics are somewhat limiting from a quantitative performance and injury analysis standpoint as discussed in detail in the ASMI limitations page. To support my areas of concern, I will detail the methodologies used by ASMI on this page. At the end of this page is a link to online copies of some the ASMI studies for those that are interested. Improving qualitative understanding of the pitching motion through high-speed videography. Developing a clinical procedure for evaluating injured pitchers. Conducting quantitative three-dimensional descriptions of upper extremity kinematics. Analysis of the resultant joint forces and torques created in pitching. Conducting appropriate cadaveric studies to assess the effects of these external loads upon the internal structures of the upper extremity. The early ASMI research studies were based on the original studies of Feltner 1989 and Feltner and Dapena 1986 and 1989. As was stated in Dillman et al. 1993, “Our purpose was to replicate some of Feltner and Dapena’s analyses as one part of a series of studies to improve understanding of upper extremity injuries (anterior subluxation, impingement, rotator cuff, etc.) to throwing athletes.” In their methods section, they also stress that their series of studies “had a dual purpose – clinical and research.” This had a direct affect on some of their methodology choices, some of which are still used today over two decades later. ASMI uses a passive optical motion capture system for their pitching biomechanics studies. They have utilized a few different systems over the years as new and better hardware systems have come out with increased camera resolution. In their early studies (Dillman et al. 1993 and Fleisig et al. 1995) they used four high-speed charge-coupled device cameras with a sampling rate of 200 Hz. Later in studies such as Biomechanics of Pitching, Zheng et al. 2004 provide details on using six electronically synchronized charged-coupled device cameras (Motion Analysis Corp.) to collect data a rate of 240 Hz. In Fleisig et al. 2011 they even used an 8 camera system for an outdoor study. As in all kinematics studies, a global coordinate system (GCS) needs to be defined before any data can be collected and analyzed. The figure below shows the ASMI laboratory convention (photo taken from Zheng et al. 2004). Once a GCS is defined, local coordinate systems (LCS) need to be defined for each body segment of interest. 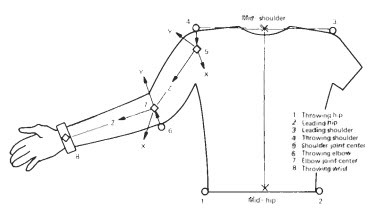 The figure below shows the ASMI LCS for the pitching arm side (PAS) shoulder (photo taken from Zheng et al. 2004). The paper by Dillman et al. 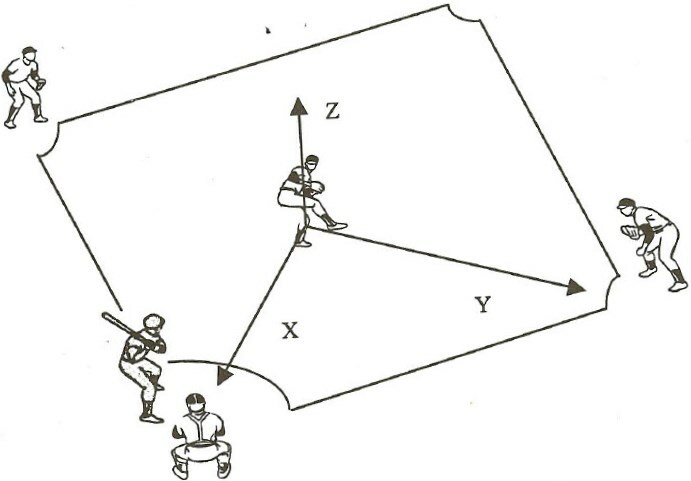 1993 has a figure that is copied below that shows LCS segmental coordinate systems for both the shoulder and elbow. From the Methods section of the Dillman et al. 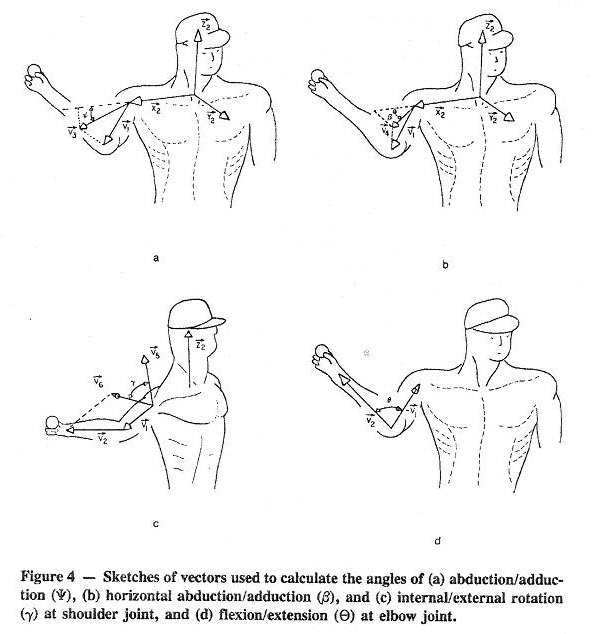 1993 paper, they write “To study arm motions about the shoulder, the body markers were used to mathematically construct a system of local (segmental) three-dimensional coordinate systems, which were used to calculate the motion of the arm in anatomical reference planes. This three-dimensional modeling technique required estimation of two coordinate axes and a translation from surface markers to joint centers. Although this technique may have less accuracy than the method of fixing three rigid markers for each arm segment, it was necessary since the resolution of the system did not allow both three markers per segment and total body analysis.” The highlighted quote is discussed further in the ASMI limitations page and this sentence is one of my biggest concerns with their resultant PAS kinematic data. In early studies like Dillman et al. 1993 and Fleisig et al. 1995 “a reflective marker was placed on the ulnar styloid process of non-pitching wrist and a reflective band approximately one cm wide was placed around the pitching wrist” as described in Cheng et al. 2004. Cheng et al. add “More recently, with improved camera image resolution, two reflective markers have been used to replace the reflective band around the pitching wrist.” In Fleisig et al. 2011, they used a 21 marker setup which was different than any of their other studies for an outdoor study; they added markers for medial humeral epicondyle, radial styloid, and dorsal surface of the hand on the PAS extremity, in addition to 4 markers that were attached to the front, back, top, and right sides of a hat. Despite adding the additional markers on the PAS extremity, their Methods section does not indicate that they used the additional markers in their kinematics calculations. The following photo was taken from Zheng et al. 2004 showing a typical indoor ASMI marker set. As discussed previously, one of the goals for the ASMI studies was to replicate the studies of Feltner and Dapena 1986. As such, the ASMI kinematics calculations are based upon that work. Feltner and Dapena used standard analytical geometry procedures for all of their vector operation for calculating joint angles. 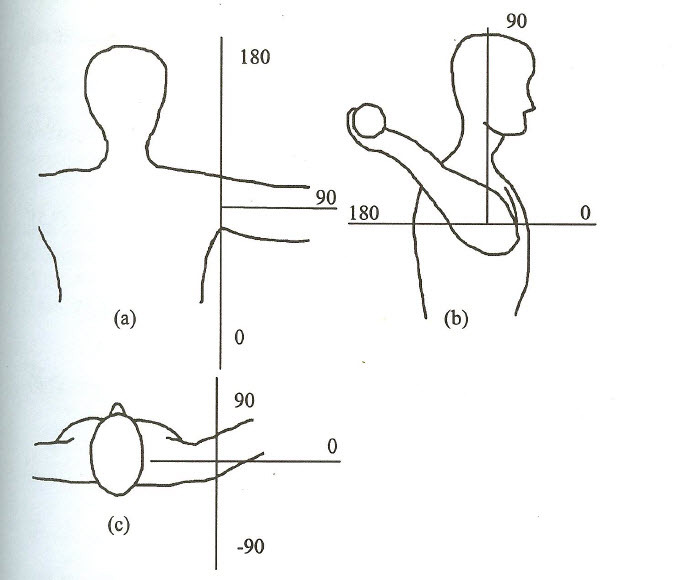 The following is taken from the Feltner and Dapena 1986 article: “To aid in the calculation of the abduction/adduction, horizontal abduction/adduction, and internal/external rotation angles at the shoulder joint, a noninertial reference frame R2, attached to the trunk, was defined (Figure 3). The values of its direction vectors (X2, Y2, , Z2) were calculated in terms of reference frame R1 for each output frame. X2 pointed from the suprasternale to the throwing shoulder; Y2 pointed anteriorly from the suprasternale, and was defined by the cross product of X2 and a vector pointing from the suprasternale to the mid-hip point; Z2 was defined as the cross product of X2 and Y2. It was also necessary to define two vectors, V1 and V2, that coincided, respectively, with the longitudinal axes of the upper arm and of the forearm (Figure 3). The abduction/adduction angle at the shoulder joint (Ψ) was calculated as the angle formed by vectors V3 and X2, where V3 was the projection of V1 on the plane determined by X2 and Z2 (Figure 4a). The horizontal abduction/adduction angle at the shoulder joint (β) was calculated as the angle formed by vectors V4 and X2, where V4 was the projection of V1 on the plane determined by X2 and Y2 (Figure 4b). 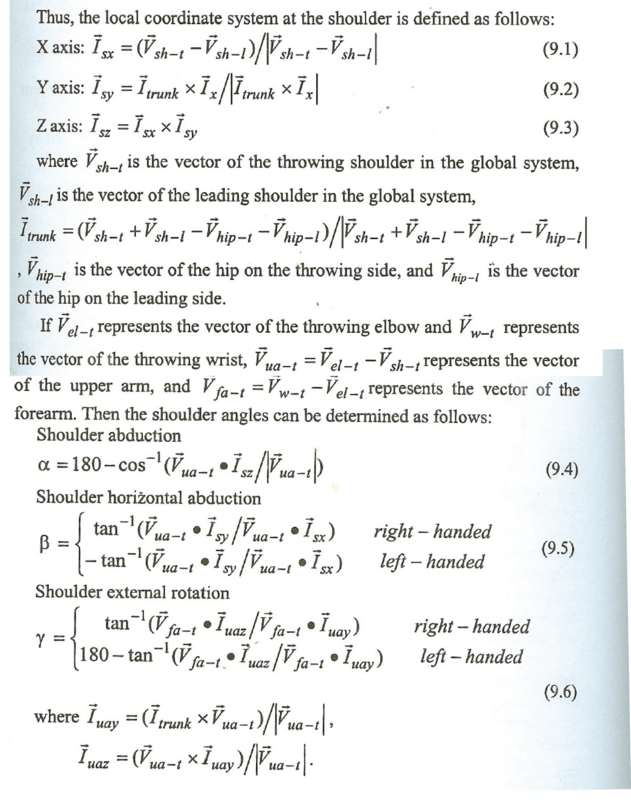 The internal/external rotation angle at the shoulder joint (γ) was calculated as the angle formed by vectors V5 and V6, where V5 and V6 were the projections of vectors Z2 and V2, respectively, on the plane perpendicular to the longitudinal axis of the upper arm (Figure 4c). 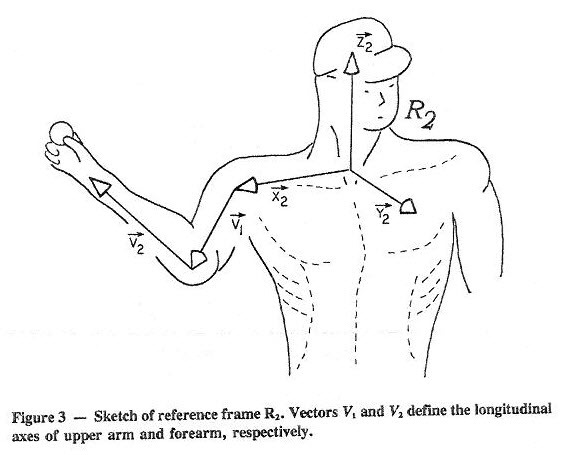 The angle of flexion/extension at the elbow joint (θ) was calculated as the angle formed by vector V2 and the reverse of vector V1 (Figure 4d).” The figure below shows the reference values and the signs for the four angles as defined by Feltner and Dapena 1986. ASMI also uses projection angles in their analyses because they want to follow clinical definitions as described previously. From Zheng et al. 2004, “Clinically, shoulder motions are are defined as flexion/extension, abduction/adduction, horizontal abduction/adduction, and external/internal rotation. The first three rotations are not independent, as only two of them are needed to determine the position of the humerus. External/internal rotation is needed to determine the rotation of the humerus about its long axis. 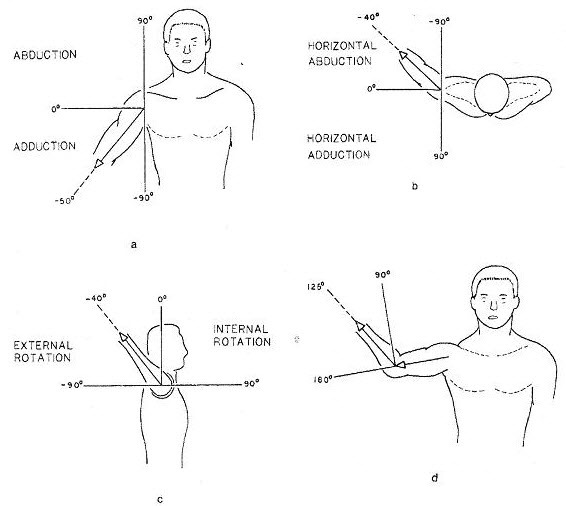 To avoid any confusion caused by the order of rotations, shoulder motion is defined as follows. Shoulder abduction is defined as the angle between the humerus and the inferior direction of the trunk (represented by the line connecting the middle point of the two shoulder markers and the middle point of the two hip markers) in the trunk’s frontal plane. Shoulder horizontal abduction is defined as the angle between the humerus and a line connecting the two shoulder markers in the trunk’s transverse plane. Third, shoulder external rotation is defined as the rotation of the upper arm about its own long axis.” The figure below was taken from Zheng et al. 2004 and shows the PAS shoulder definitions, which are the same as the angles shown in the above Feltner and Dapena 1986 plot, but the absolute magnitudes are different based on how the neutral orientation is defined. The steps listed below are very important for understanding how ASMI calculates shoulder kinematics. As in Feltner and Dapena 1986, they define segmental LCS using the body markers and cross products to ensure orthogonality. They specify the X axis first using the two shoulder markers, they then use a cross product of this X axis with the trunk vector, which is defined as going from the midpoint of the two hip markers to the midpoint of the two shoulder markers, to define the Y axis. Finally, the cross product of the X and Y axes is calculated to determine the Z axis. They then define two arm vectors just as in Feltner an Dapena 1986, defining the longitudinal axes of the upper arm and of the forearm. 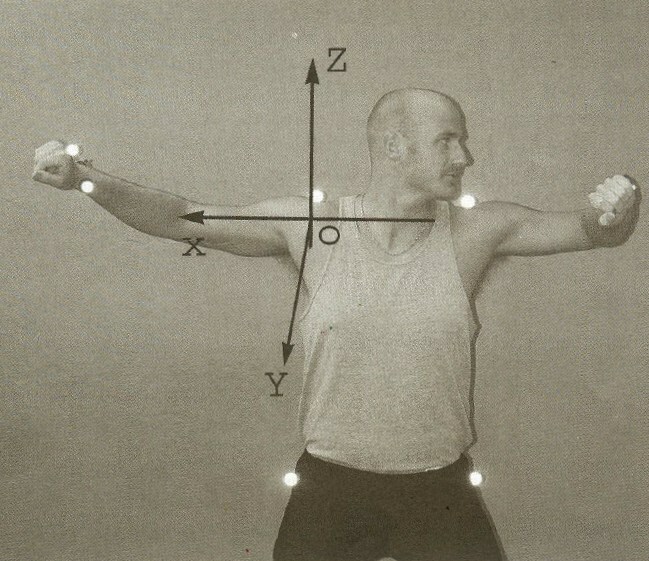 Analytical geometry techniques are then used to determine the 3 shoulder angles. The following figure shows the methodology used for calculating the shoulder LCS as taken from Zheng et al. 2004. This process is repeated to define segmental LCS for the elbow, forearm/wrist, and trunk. See Biomechanics of Pitching by Zheng et al. 2004 for more details. One key concept to understand about the ASMI methodology is that their external rotation calculation is not a true measure of humeral external/internal rotation. In the ASMI limitations page, I go into more detail about the ASMI marker set and how that affects this measurement specifically. However, there is another issue with this measurement as described in Section 9.4.2 in Biomechanics of Pitching by Zheng et al. 2004: “Because of how it is calculated, this maximum external rotation is actually a combination of glenohumeral rotation, sternoclavicular motion, and extension of the spine.” This is also discussed in greater detail in the ASMI limitations page. While the previous information is taken from published research articles, we do know that ASMI has changed their marker protocol. With camera technology advancements, they now have the availability to record data at up to 450 Hz and can use up to 38 reflective markers based on reports in the video below. However, no new research papers have been published with these updated marker protocols to determine if PAS kinematics have changed.